The Arizona Diamondbacks (often shortened as the D-Backs) are an American World Series championship (in 2001), becoming the fastest expansion team in the Major Leagues to win a championship, doing it in only the fourth season since the franchise's inception in the 1998 Major League Baseball season. 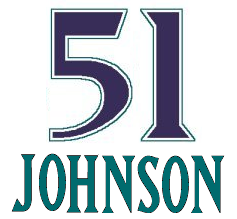 The Diamondbacks' original colors were purple, black, teal and copper. Their first logo was an italicized block letter "A" with a diamond pattern and a snake's tongue. Prior to their inaugural season, they released their baseball caps. The home cap had a cream color crown with a purple visor and button. The road cap was black and had a turquoise visor and button. Their alternate cap had a turquoise crown with a purple visor and button. Depending on the cap, the "A" logo on the front of the cap had different color variations. Jeff Munn is a backup radio play-by-play announcer; he served as the regular public address announcer at Chase Field in the early days of the franchise. He is well-known to many Phoenix area sports fans, having also served as the public address announcer for the Suns at America West Arena (now Talking Stick Resort Arena) in the 1990s. He is also the play-by-play radio voice for ASU women's basketball. On November 1, 2006, the team announced that the TV voice of the Milwaukee Brewers since 2002, Daron Sutton, would be hired as the Diamondbacks primary TV play-by-play voice. Sutton was signed to a five-year contract with a team option for three more years. Sutton is considered one of the best of the younger generation of baseball broadcasters. His signature chants include "let's get some runs" when the D'Backs trail in late innings. 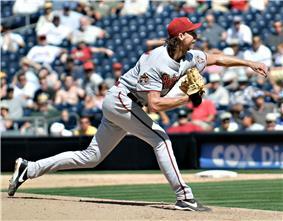 Sutton's father is Hall of Fame pitcher and current Atlanta Braves broadcaster Don Sutton. The Diamondbacks announced in July 2007 that for the 2008 season, all regionally broadcast Diamondback TV games will be shown exclusively on Fox Sports Arizona, and a few could possibly be shown on the national MLB on Fox telecasts. Fox Sports Arizona (or FSArizona) is currently seen in 2.8 million households in Arizona and New Mexico. The previous flagship station, since the inaugural 1998 season, was KTVK, a popular over-the-air independent station in Phoenix. From 2009 to 2012, Mark Grace and Daron Sutton were tagged as the main broadcasters of the Diamondbacks with pre-game and postgame shows on FSArizona, being hosted by former big-league closer Joe Borowski. On June 21, 2012, Daron Sutton was suspended indefinitely, amid rumors of insubordination. Then on August 24, the team announced that Mark Grace had requested an indefinite leave of absence after being arrested for his second DUI in less than two years (Grace was later indicted on four DUI counts). 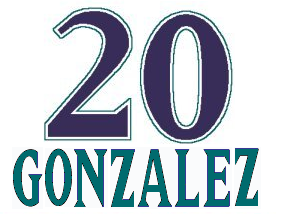 For the remainder of the 2012 season, Sutton was replaced by Greg Schulte (Jeff Munn replaced Schulte on the radio broadcast) and Grace was replaced by Luis Gonzalez. At the end of the 2012 season, the team announced that neither Sutton nor Grace would be returning for the 2013 season. The flagship Spanish language radio station is KBMB AM 710 with Miguel Quintana, Richard Saenz and Oscar Soria. all stats as of 7/28/2015 from the Arizona Diamondbacks website. ^ a b c "D-backs shed their skin after unveiling new uniforms, colors on runway," Arizona Diamondbacks press release, Wednesday, November 8, 2006.